There is just something about underwater photos that make it look all like a dream. Perhaps it is the surreal feel surrounding the moray eel that you have just snapped, or the ruins of the great Titanic that has sunk to the bottom of the ocean, with its hulking frame forming part of the underwater scene that greets your eyes, where its once luxurious rooms are now homes for all sorts of ocean dwelling creatures. As for the kind of equipment used to snap such photos when underwater, they are nothing short of being super expensive – at least, when compared to your regular camera, that is. These days, underwater casings for a standard issue DSLR or even a regular consumer class digital camera are still expensive, but not so much priced out of reach of the ordinary citizen after saving up for a while. However, if you have yet to jump aboard the digital camera bandwagon, there is always the backup which is an iPhone (or perhaps, the new HTC One X) that has a spanking camera sensor built in. 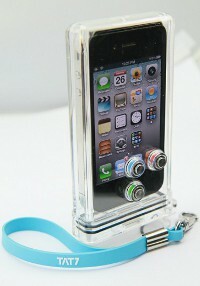 However, since iPhones and water do not mix too well, this is where the TAT7 iPhone Scuba case comes in handy.